Opioid addiction in the United States has taken a dramatic turn for the worse in recent years. According to the CDC, an average of 130 die each day from opioid overdose. The current opioid crisis has grown to an alarming scale and includes this jarring statistic: 68 percent of the 70,000 drug overdose deaths in 2017 involved an opioid. Access to opioids has substantially increased since the late ‘90s as well as illegal synthetic opioids like fentanyl. You may have heard of fentanyl from recent headlines talking about the impact of these synthetic opioids on the nation’s opioid overdose rates. Opioid addiction can creep up on an individual that may have predisposed substance use disorder (SUD) or a possible overprescription. Taking the time to evaluate opioid abuse risks can significantly lower your chances, or a family member’s chance, of experiencing an overdose. So what are some best practices to reduce the risk of opioid misuse or abuse in your daily life? If you are prescribed opioids make sure they are stored in a secure and safe area. Small children could accidentally chew, swallow, or consume the pills, which may lead to a medical emergency. Additionally, any family member or friend with a history of substance abuse may use your supply of opioids for recreational use. A personal safe, cupboard, or another storage area with a lock is the best place to secure opioid prescriptions. It may also help to put the pills in a place only you can find if you don’t have immediate access to a locked storage area. Opioids can help treat significant physical pain and are usually prescribed through your primary care provider or another medical specialist. However, a person can sometimes receive a substantially larger prescription than needed. Not sure where/how to safely dispose of excess opioids? Call or contact your nearest pharmacy provider. Usually, a pharmacist can help you contact the appropriate agency to help dispose of opioids. 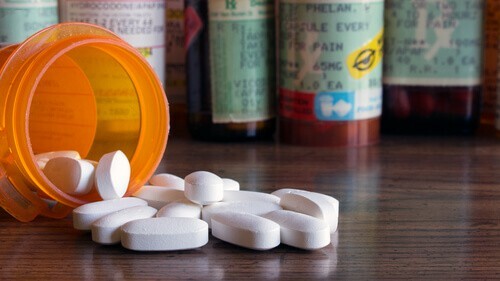 A significant risk factor for developing an opioid dependency, and eventually dangerous opioid abuse, is relying on opioid prescriptions to manage pain. Alternative therapies for pain management can greatly reduce the risk of developing an addiction to opioids. Ask your primary care provider or a specialist about alternative pain therapies and treatments that aren’t opioid-based. A physician can help you manage pain and refer to the proper specialists without an opioid medication. If you believe you have an opioid dependency, or are at risk for opioid addiction, ask your doctor about medication-assisted treatment (MAT). MAT is a combination of FDA-approved drugs and behavioral therapy to treat substance abuse. Recently, the medical community has advocated MAT as an effective tool in reducing opioid abuse. The opioid crisis can be extremely scary and complicate your medical decisions. Make sure to consult with your primary care provider, urgent care specialists, and other related medical professionals to safely manage the addiction risks of opioids.